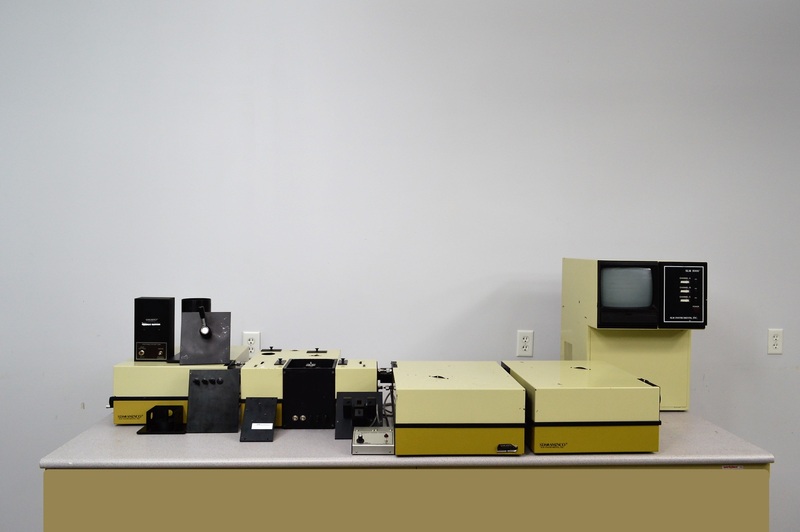 Aminco SLM-8000C Spectrofluorometer Fluorescence Analytical Spectroscopy . New Life Scientific, Inc. The controller is in fair cosmetic condition with obvious age. The technicians were unable to load an image on the monitor and concluded that it is dysfunctional. The monochromators feature adjustment dials or knobs, but the MCN320N does not; the technicians were able to turn the pieces manually, but cannot test them. The cuvette holder and optional attachments have signs of wear, but the cuvette's magnetic stirrer did power on. The system will be sold for parts / in need of repairs, because it is obviously older, largely untested, and ideal for an experienced user or technicians that can test them or disassemble them for parts. *Please note there are no cables nor cords included. *This product does not include the NLS warranty.